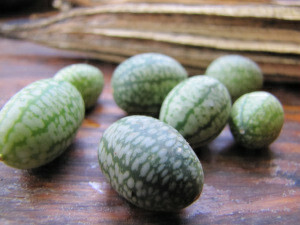 Where did you get your Mexican Sour Gherkin seeds from? We got ours from Bakers Creek Heirloom seeds the first year, but Anna discovered an easy way to harvest Mexican Sour Gherkin seeds, and that's what we do now. (This is an entirely different subject but I don't know how to post it.) I've noticed that my cherry tomatoes which I've cloned for a few years are a different shape on the plant in the field compared with the other tomatoes than are up by the house. They are oblong instead of round. Could this be because they are being pollinated by nearby romas? If that is the case, will my stupices be affected? Interesting question. I don't see how being pollinated by another variety would affect the shape of the tomatoes on that plant --- it should only affect the offspring, and even that is pretty unlikely since tomatoes are nearly always self pollinating. (We grow a lot of different varieties side by side and they always breed true.) That said, I never have quite understood how being pollinated by hot peppers can make sweet peppers hot --- I need to look into that. What I think is more likely is that environmental conditions are affecting the shape of the fruit. I think that your indoor plants were suffering a bit from lack of fertility and sunshine, despite their window location, while your outdoor plants might be drought-stressed. I'd be curious to hear a description of the shape of the indoor vs. outdoor tomatoes.